The Short-eared Owl (Asio flammeus) is in family Strigidae. Owls are classified into two general groups: the typical owls of family Strigidae and the barn owls of family Tytonidae. Asio flammeus is a species of typical owl. Owls belonging to genus Asio are known as the eared owls, which are characterized for tufts of feathers resembling that of mammalian ears. These "ear" tufts may or may not be visible. Asio flammeus will display its tufts when in a defensive pose. However, its very short tufts are usually not visible. The Short-eared Owl is an owl of the open-country and grasslands. Asio flammeus, the Short-eared Owl, is a medium-sized owl averaging 34-43 cm in length and weighing from 206-475 grams. 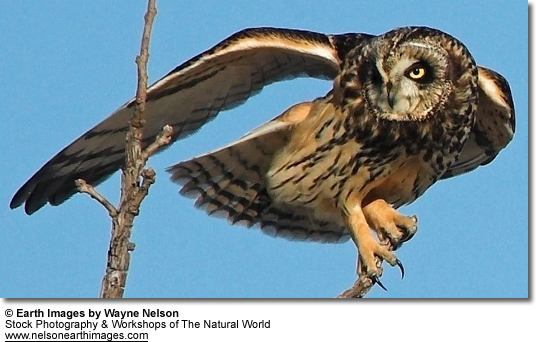 In general, the Short-eared Owls have large eyes, big heads, short necks, and broad wings. Its bill is short, strong, hooked and black. 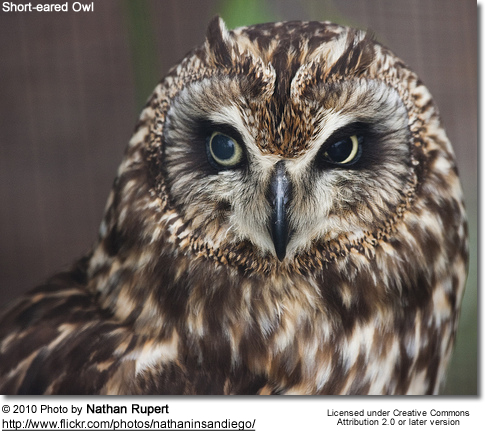 Its plumage is molted tawny to brown with a barred tail and wings. The upper breast is significantly streaked (Alsop 2001). Wingspans range from 85-103 cm. Females are slightly larger than males. The yellow-orange eyes of A. flammeus are exaggerated by black rings encircling each eye, and large, whitish disks of plumage surrounding the eyes like a mask. The word flammeus is Latin in origin meaning “flaming, or the color of fire”. The Short-eared Owl’s geographic range extends to all continents except Antarctica and Australia. Asio flammeus is considered to have one of the largest distributions in the world. A. flammeus breeds in Europe, Asia, North and South America, the Caribbean, Hawaii and the Galápagos Islands. This owl is partially migratory, moving south in winter from the northern parts of its range. 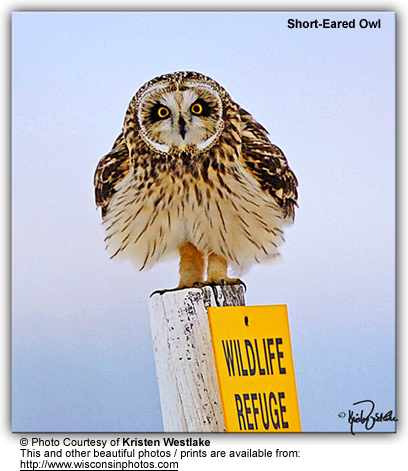 The Short-eared Owl is known to relocate to areas of higher rodent populations (Ehrlich 1988). It will also wander nomadically in search of better food supplies during years when vole populations are low. See a map of the Short-eared Owl's distribution across the New World. 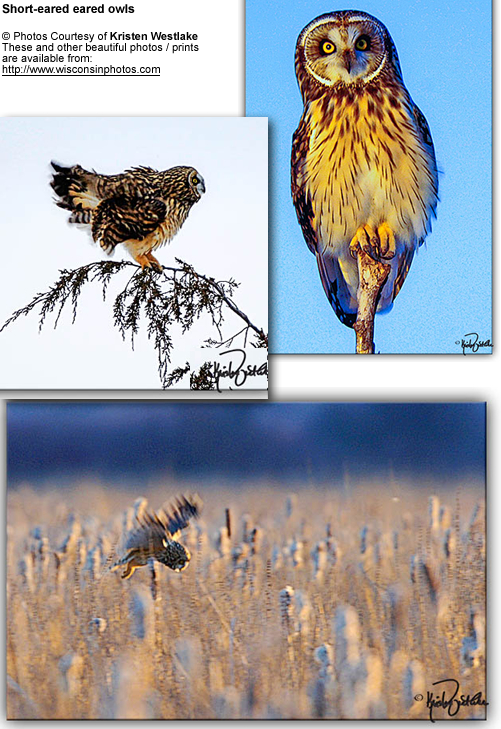 The Short-eared Owl nests on the ground in prairie, tundra, savanna, or meadow habitats. Nests are concealed by low vegetation, and may be lightly lined by weeds, grass, or feathers (Ehrlich 1988). Approximately 4 to 7 white eggs are found in a typical clutch, but clutch size can reach up to a dozen eggs in years when vole populations are abundant. There is one brood per year. The eggs are incubated mostly by the female for 21-37 days. Offspring fledge at a little over four weeks. This owl is known to lure predators away from its nest by appearing to have a crippled wing (Alsop 2001). Sexual maturity is attained at one year. Breeding season lasts from March to June, peeking in April. During this time these owls may gather in flocks. During breeding season, the males make great spectacles of themselves in flight to attract females. The male swoops down over the nest flapping its wings in a courtship display (Ehrlich 1988). These owls are generally monogamous. Hunting occurs mostly at night, but these owls are diurnal (active in the daytime), crepuscular (active during the twilight), as well as nocturnal (active at night). The Short-eared Owl tends to fly only feet above the ground in open fields and grasslands until swooping down upon its prey feet first (Alsop 2001). Several owls may hunt over the same open area (Kaufman 2000). Its food consists mainly of rodents, especially voles, but it will eat other small mammals and some large insects (Ehrlich 1988). Its flight is known to be characteristically floppy due to its irregular wingbeats. The Short-eared Owl may also be described as "moth or bat-like" in flight. 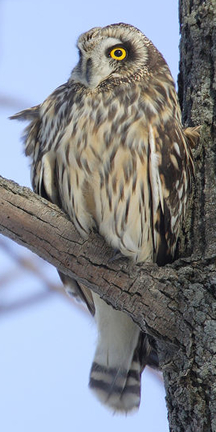 Short-eared Owls have a scratchy bark-like call. A raspy waowk, waowk, waowk or toot-toot-toot-toot-toot are common. A loud eeee-yerp is also heard on breeding grounds. However, Short-eared Owls are silent on the wintering grounds (Alsop 2001). 1. The Short-eared Owl has been known to territorially compete with the Barn Owl. 2. The Short-eared Owl may nest on recovered or replanted mines. This nesting adaptation was observed farther south than the breeding range Asio flammeus would normally occupy. This makes the Short-eared Owl one of the few species to which strip-mining has become an advantage!